The male red-winged blackbird is glossy black with a prominent red and yellow patch. The red-winged blackbird is one of the most common birds in North America. They are found as far north as Alaska and central Canada and as far south as Costa Rica. From west to east, they have healthy breeding populations from California to Maine. They often migrate between their northern and southern habitats, but some populations in the western U.S. have been known to establish territories that are static year-round. Male red-winged blackbirds are easily identifiable with their glossy black bodies and prominent red and yellow patch on the top of the shoulder. Females are much more drab, with mostly brown and black speckled bodies and appearing more like a sparrow. They also have a white stripe near the eyebrow and a much paler breast. Both males and females have wide shoulders with a slender bill and medium length tail, which the males will often flare. There are many different populations of red-winged blackbirds that differ significantly in size and proportion. However, studies show that no matter which region chicks are raised in, they tend to resemble their parents, suggesting that environmental factors play a much bigger role in appearance than genetics do. 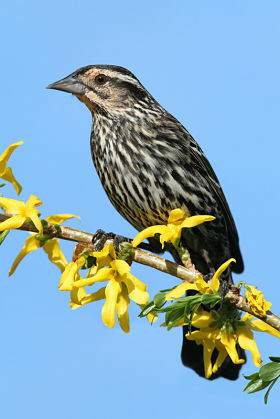 The female red-winged blackbird is much more drab than the male. However, one subspecies of the red-winged blackbird in California lacks the yellow stripes along with the red shoulders altogether. Scientists believe this may help the birds distinguish their species from one another where they overlap with the tricolored blackbird. 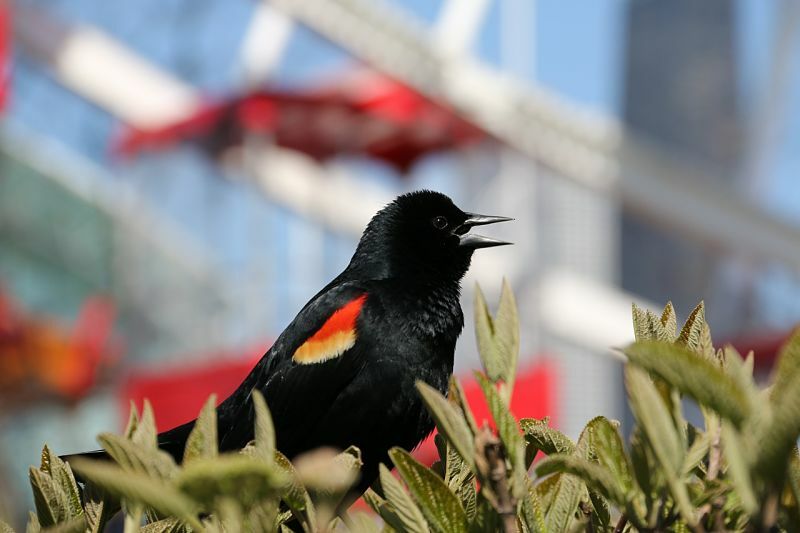 There are a number of different red-winged blackbird call sounds from the “Okalee Song” used by males to warn off other males to the “Twitter Call” that is used during courtship by both males and females. You can listen to recordings of the different calls here. It’s easy to spot red-winged blackbirds in fresh and saltwater marshes as well as human constructed areas such as water features on golf courses and wet roadsides. They can also be found in dry meadows and fields, as well as cropland and pastures. In fact, they are often considered a pest to crops like corn, sunflowers, and rice and a considerable amount of time and money has gone into eradication programs for these birds near farmland. Because of this, humans are the main contributor to the mortality rates of this species. Besides crops, red-winged blackbirds also feed on insects during the summer, and seeds like ragweed and cocklebur during the winter. They can often be found at the base of different aquatic plants, peeling apart the stems to get to insects and other food sources. These birds are incredibly aggressive, especially the males during breeding season. The males will chase off any intruder that comes into their territory and have been known to attack much larger organisms like horses and humans that get too close. During breeding season they will spend more than a quarter of daylight hours defending their territories. Red-winged blackbirds roost in flocks year long. In the summer during breeding season, the flocks are often much smaller, but in the winter can be as large as several million birds consisting of other red-winged blackbirds, starlings, and blackbirds. During these large flocking times, they will often travel as far as 50 miles away to feed during the day, then re-roost all together at night. Depending on the confidence of the male red-winged blackbird, they can puff their feathers up to make their colorful shoulder patches more readily apparent. The males spend most of their days perched high in trees, cattails, and other plant tops trying to attract females and aggressively defending their territory from other birds. Females, however, tend to stay lower, picking through vegetation for food and searching for nesting material. Red-winged blackbirds are highly polygynous, meaning males will have many female mates – sometimes as many as 15 per territory. Nearly 90 percent of males have more than one female nesting in their territories. However, it was recently found that up to one-half of all nestlings were sired by separate males, meaning that the females are also likely to have multiple mates. During breeding season, the female red-winged blackbirds typically do most of the nest building, although the site is picked by both males and females. The nest is often located near the ground or water, in between dense grass-like vegetation. The female will build the nest by winding stringy and fibrous plant material around multiple stems. She then creates a platform from wetland vegetation between the stems that is held up by the other plant material. The female will add more wet leaves around this structure and plaster the inside with mud to create a cup. She will finish the nest by lining the mud cup with soft, dry grasses. The final nest is roughly four to seven inches across and three to seven inches deep. The female red-winged blackbird will lay roughly two to four eggs which incubate for 11 to 13 days. During this time, both males and females will aggressively defend the nest from intruders. Once hatched, the blind and naked baby birds will remain in the nest for another two weeks before leaving to establish their own territories. Though they are possibly the most abundant bird in North America, red-winged blackbird populations declined by 30 percent from 1996 to 2014. Their breeding population is down 60 million to 130 million, but they are still considered of least concern. Hey Buddy!, I found this information for you: "The Red-Winged Blackbird". Here is the website link: http://backyardbirdingblog.com/red-winged-blackbird/. Thank you.